Her HEART is totally with the Horses, but she shouldn't have to sleep in the corral! I've mentioned Shirley Allen before because she was a leader in saving the real Phantom (you can see her & the big guy on tape http://www.kolotv.com/home/headlines/4788886.html). Formally, Shirley operates Lucky Horse Corral, rescuing wild and domestic horses, but around the wild horse world, Shirley is famous for much more. 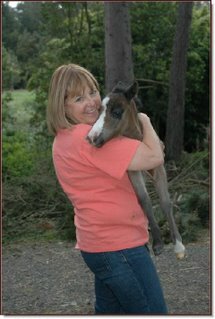 She champions "lost cause" horses, taking endangered orphan foals into her home (even her bedroom in cold weather!) and raising them through rocky colthoods until they can be adopted. When a serious house fire slowed Shirley's good deeds WAY down two weeks ago, her neighbors came to the rescue, but more needs to be done. Now, if you're reading this in Vancouver or San Francisco or Newcastle or New York, you probably can't drop by the FUN Rebuild-the-House party, but I hope you'll read on to see how "neighborly" is done in this part of Nevada! The benefit is planned for tomorrow, Saturday June 30 from 2-6 p.m. at Our Park on Highway 50 just west of S & S Mini Mart in Dayton, Nevada. I'm not sure where this is, but I expect to find my way there because I'll be signing books from 2-3:00 for a Rebuild-the-House fundraiser. There'll be hundreds of horse people, live music, raffles & silent auctions of many cool horse-related things, a tack sale and a spaghetti dinner...oh, and an ice cream truck! If you're there, please come say "hi". I'll be the one writing in books! When I saw one of my books on a bookstore table labelled: WHAT TO READ WHILE YOU'RE WAITING FOR HARRY, I thought I'd give you a few suggestions of my own. I'll start (briefly) with the one of mine I saw on the table & give you a few others that are ABNORMAL reads for NORMAL readers. When Gwen and her parents abruptly move away from their coastal family seat, her clairvoyant grandmother predicts that forces "no mortal can imagine and no female can resist" will draw her back. Sure enough, when Gwen, 17, returns for a summer job, she falls for exotic wanderer Jesse and finds herself immersed in a modern, California version of a Scottish selkie myth. by Laura Amy Schlitz -- 4 grade and up! The book's first sentence gives you a glimpse of the style & humor to come: "On the morning of the best day of her life, Maud Flynn was locked in the outhouse, singing, The Battle Hymn of the Republic." Maud, like ANNIE, is an orphan with sudden good fortune. She's showered with beautiful clothes and great food. She lives at a wonderful beach house But why is Maud kept hidden by the sisters who adopt her? And what would the deaf housekeeper tell her, if only she could? Lots more going on beneath the surface of this book than you expect! Of course you've heard of were-wolves, but what about wereowls? If they run in your family, you're used to shape-shifting and flying around in the night. But what happens if you have a crush on your science teacher and as you're flying over his house you notice this creepy boy lurking in the bushes? How do you explain? Maybe it's because I'm writing a book with the pueo -- Hawaiian owl -- in it that I found this book so funny/dreamy/creepy, but I liked it a lot. Mary Jane Magorski's life is dull. She needs excitement. She needs adventure. She needs a better job. And then one morning, right there behind the perfume counter, she unpacks a box of antique bottles and finds one that glows with emerald light. Her supervisor buys the bottle and gives it to Mary, but that's Unfortunately the last good thing that happens to her for hours. First: she's fired from her job. Next: her landlady kicks her out of her apartment for harboring a stray dog. After that: her purse is stolen, and finally her birthday bottle shatters. But then a strange green fog pours from the bottle. When the fog lifts, Mary is stunned to see a six-foot-tall pirate captain. Sinjin Avery is dark, dangerous, handsome. He's a genie, who now belongs to Mary. The Phantom is hanging close to where he was before. Up on the hill above the saddle horse/pond pasture. Apparently doing extremely well. Yeah!!!! If you have NO idea what I'm talking about, you haven't read my one and only Celtic fantsy. If you're jumping up and down, waving your hand like a crazy person,shouting "Me! Choose me!" I hear ya. It's exciting that lots of you are loving (or loved, or are RE-loving..)SEVEN TEARS INTO THE SEA. As a thank-you, some bookmarks for readers are in the works. Of course the misty and mysterious cover art will be on one side. On the reverse, I'll feature your favorite quote from the book. I will, that is, as soon as I find out which quote you love best. Please send me your top three favorites & if there's time (got to get 'er done this week!!! ), we'll have a vote to see which is the favorite of most readers. And if you try shedding your own seven tears into the sea this summer, let me know what happens! The very idea gives me chills. When it gets too hot at your house this summer, try reading WILD HORSE WINTER by Tetsuya Honda. You might think this picture book is only for young children. In my opinion, though, you'd be wrong. Although the text is supposed to be based on fact, there's magic in an ancient breed of horses which burrows beneath the snow to stay warm and sheltered during winter blizzards. How many horse-lovers have imagined curling up to sleep with a warm pony? YES, it's too dangerous for most of us to attempt, but once you see the real Dosanko ponies (for a live action view, check out: http://www.youtube.com/watch?v=-6DyEpCwuEQ&mode=related&search=), you may dream of it tonight. MORE SUMMER FUN! Wish you could spend your time hanging around a barn with other horse lovers (and HORSES of course) ? Here's the next best thing, and there are lots of opportunities to experiment with your writing, as well. I met the site's "lead mare" Michelle at the Western States Horse Expo two weeks ago, but I had no idea how cool the site was until I started exploring. Here are some things you might like! Perfect Horse -- Create the horse of your dreams and, if you want, write its story! Blog Contest: Every Picture Tells a Story -- wow, the photos up right now show a pinto on the run (wonder where her rider went? ), a paint playing with a snowman and an exquisite beach horse, but you have to hurry, because the entry deadline is Sunday the 24th. In addition, I may do one of the site's interactive interviews. Please write and tell me what you think! Enjoy every minute of the longest day of the year! Make (good) memories! Lots of you know that the first story I remember writing was about a wild pinto stallion. I was 8, and only showed my creative writing to my family and friends, but I always wondered, just a little, if my work was good, or if people were just being nice. So, I'm kind of excited, because I think I've discovered a very cool place for my readers to test their writing (and artistic!) skills. Former librarian Paul Kelsey is the editor and publisher of Launch Pad: Where Young Authors and Illustrators Take Off! You know how obsessed I am about checking out contests I mention to you? Well, this looks like a good one. To quote Mr. Kelsey: "Young authors and illustrators certainly do not need to subscribe to our magazine to get published! In fact, each contributor will receive a free subscription to Launch Pad, a T-shirt, a bookmark, and a letter of commendation sent to their principal, favorite teacher, or librarian. Each contributor will also receive three free copies of the issue containing their work to share with family and friends." Launch Pad: Where Young Authors and Illustrators Take Off! is scheduled to debut with a January/February 2008 print issue. Amazon.com & BN.com published the covers of the first three WILD HORSE ISLAND horses last week and now Amazon has the first FIVE titles up, too! Frisk on over for a peek and tell me what you think, okay? This is a question lots of people ask when they find out I've written close to thirty books. I always have a different answer, but really? They're everywhere! Ideas, that is. I get zillions of them and so do you. Newspapers are a wonderful source and I hope the Internet never replaces them. I would NEVER HAVE READ a story about a man killed by a pig falling from a third story window. Funny, sad, strange.. and I WILL work that into a book. Just you wait and see. Another source is fairy tales, myths and legends. It's so much fun to think how different they'd be if they were moved or modernized! That girl zzzing away in the back of your classroom all the time, well what if she's not a late night type? What if Sleeping Beauty was her great-great-great-great grandmother? Imagine putting Pinnochio in your school. Not that he'd get harassed about his wooden elbows. Much. Would his nose grow when he says, "My cricket ate my homework" ? And don't get me started on Little Red Riding..."Hey, nice hoodie, girl, what's in the basket?" Have you ever misheard things on the radio? Did he say "...McDonald's employees are walking into the sea"? That can't be right, but it creates a mental picture you can explain with your imagination. Story ideas are all around you. They float in the air and your brain is Velcro -- but you have to write ideas down. Just a few words will remind your mind when you do have time to write. It's good to be writing to you again and I have lots of news. >Plans for an updated Phantomstallion.com website are underway and they include more interactive fun, a chance to sign up for newsletters and a shared presence for the original Phantom Stallion series and "Wild Horse Island." >HORSE THEFT: You've read about it in my books (think KIDNAPPED COLT), but it's a real problem with a real solution. Want a chance to help stolen and lost horses get back home? Check out : http://netposse.com/ and you can do just that. NO JOKE -- since you'll be going to shows and rodeos and other horse events, you are the perfect eyes and ears to help horses return to those they love and miss. Example -- a mustang sorrel named Dream is missing from Spartanburg, South Carolina and her owner is offering a reward for her return, Black Russian Lady, a Cavalier Horse went missing in a Pennsylvania storm, a blue roan foal was sold by someone leasing pasture to its trusting owner. More stories & more ways to help on this detailed website. >I've just received word that Shirley Allen, the horse angel who helped save the real life Phantom and many orphan mustangs (keeping the most recent one in her bedroom because he was so weak and needed her so much) has lost her house to fire! Keep an eye on my blog for how you can help! Sam was by the burly cowboy's haiku poetry about the world of Riverbend Ranch. Please submit your nature-themed haiku to National Wildlife Federation by June 30th. Select haikus will be posted in next month's Wildlife Online. Haiku are traditionally written in three lines of 5-7-5 syllables. Here's one of Ross' haiku poems about the Phantom. You can see the way he -- like most American poets -- use the 5 syllables for the first line -- 7 syllables for the second line and back to 5 syllables for the third line to imitate the Japanese form of writing. past summer sage, sandstorms, clouds. Fly me with you. High." I'll be flying to southern California really soon for a booksigning at Storyopolis Bookstore in Studio City, California. I've posted the official announcement below, but I would LOVE to talk writing & horses with anyone who comes to visit! Storyopolis proudly presents acclaimed author Terri Farley of the widely popular “Phantom Stallion” chapter book series. Adored by readers everywhere, this series follows the incredible journey of wild horses and the latest book “Phantom Stallion: Wild Horse Island #1: The Horse Charmer,” is the first in a wonderful new series. To celebrate this wonderful author and the unveiling of this incredible book, there will not only be a presentation and signing, but a fun Hawaii hula themed décor as well. Keeping my hands full -- in the nicest way! The next WILD HORSE ISLAND book is in the mail, on its way to New York from Nevada. As a very nice end-of-book treat, I made friends with the cutest miniature horse imaginable! Here we are, giving new meaning to the expression "Hold your horses:"
I'll be offline, finishing my next book this week. Next weekend, I'll (fingers crossed) be back in touch! Want to peek over my shoulder? I didn't really plan to have company while I was writing the last three chapters of book five for Wild Horse Island, but that's how it worked out! A great TV crew paid me a visit and literally shot over my shoulder, scanned my notes and focused on my some books and objects that inspire me. While you're there, you'll have a chance to look at other Phantom news clips too. Know why? Bob and Betty Retzer live right on the edge of Phantom Stallion country and not only do they have wild horses of their own, they were vital to saving the Phantom and his family. And, I don't think they'd mind if I posted this link, too, http://www.bobonthe.net/horses.htm because it will show you their OWN wild horse family members.